Before you take another bite of your beef-filled taco, let’s step into the Aztec world of ceremonies and sacrifices. Upon researching reasons for sacrifices, I came across hundreds and hundreds of Aztec gods. Each god had its own reason for existing to the Aztecs. Therefore, Aztecs sacrificed a human as an offering to that god for a better chance of making it to the next realm (the afterlife). If not for that reason, the Aztecs wanted to please the gods because, I don’t know about you, but I don’t like when a hell-spewing mountain erupts two feet away from me (volcano), or a wall of water propels my house into the depth of the ocean (hurricane), or the sun is lining up to crash into the Earth (eclipse). Nowadays we know better than to live next to a volcano…that’s erupting; and if there’s a flood, we know to do our best to get out of the situation fast. We know what is happening in the sky thanks to Google, Yahoo News and NASA.com. But the Aztecs of course did not have this knowledge, and yet the irony is we still do not have some of their knowledge. Although we know about space and weather and why things happen, the Aztecs believed things happened because they were thought out by a particular god. So if the corn was doing great that year, the earth god was pleased. If there was a drought and nothing was growing, the Aztecs thought they were being punished and had to give something back to the god in order for the god to be pleased again. And what better gift to give then a beating heart ripped from one’s chest? Hallmark has nothing on the Aztecs. While the Aztecs were at the market picking out fruits and vegetables, they could also buy slaves because they were sold there, right next to the beer and corn. But who would purchased these slaves, and for what reason? The high priests and merchants. They would seek out the best-looking and most talented slaves. If you could sing and dance and were really smart, all the better. For you weren’t about to be put on a dating website to fill in your profile answers, but sadly you were the best man for the job of being sacrificed to please a god. In the build-up to the sacrifice, there were many festivals. There were grand feasts for the noblemen and merchants. The slave of course entertained while the other Aztecs got a pat on the back for picking such a great slave to be given to the gods. Nine days before the slave was given up he was washed in holy spring water given to the Aztecs by one of their many gods, such as Huitzilopochtli, a war god who took many different forms and meanings with each altered spelling of his name. The slave then began religious preparations for his own sacrifice. On the big day, the slave was led four times around “the Great Temple” (the gods’ temple) and brought up the steep steps of the pyramid to the high priest. The priest, dressed as the god the slave was being sacrificed for, lay the slave across a sacred stone. The chest was then sliced open and the palpitating heart was torn from its cavity. Tezcatlipoca was another very special god to the Aztecs, who referred to him as “smoking mirror,” the creator god. They considered him the lord of the shadows and believed he had a magic mirror that saw into their everyday lives, allowing him to manipulate their lives as he pleased. The Aztecs had a very special ceremony to honor Tezcatlipoca. At the end of each year, the Aztecs chose a young man who has not a slave but had good looks and intelligence to represent the particular god. For a whole year he was treated as his embodiment. By day he lived in the gods’ temple. There he learned to play a mean flute and learned dances only the Tezcatlipoca knew. By night he was sent into the villages, followed by at least eight warriors, and there he would play the flute and show his dance and bless the sick. As another year drew to an end, the preparations for the sacrifice grew intense. The emperor visited this young man at the gods’ temple and dressed the young man in a costume sacred to the god. The youth was given four young wives who were known to be embodiments of significant goddesses. On the day he was to be sacrificed, he was led to a shrine of Tezcatlipoca on the Great Pyramid. There he said goodbye to his four wives. He then lay upon a sacred sacrificial stone, and while alive of course his heart was ripped from his chest. Cannibalism was thought to have played a role in some rituals. Some historians theorize that Aztecs participated in cannibalism as a way to commune with their gods, while others conclude that Aztecs believed they could acquire the victim’s strengths and talents if they consumed parts of their body. 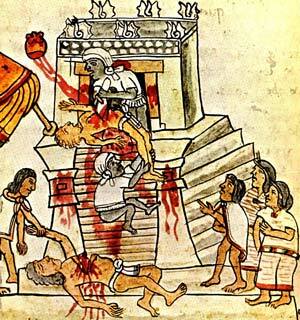 Aztecs weren’t alone in this gruesome history. Let’s face it. Humans have been devouring each other across the planet for centuries. 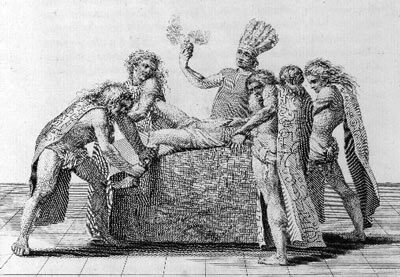 Historical evidence of cannibalism, especially for rituals, has been found on six of the seven continents (sorry, Antarctica). Now that you’re a little wiser about ancient Aztec ceremonies and sacrifices, you can get back to taking that big bite out of your beef taco.